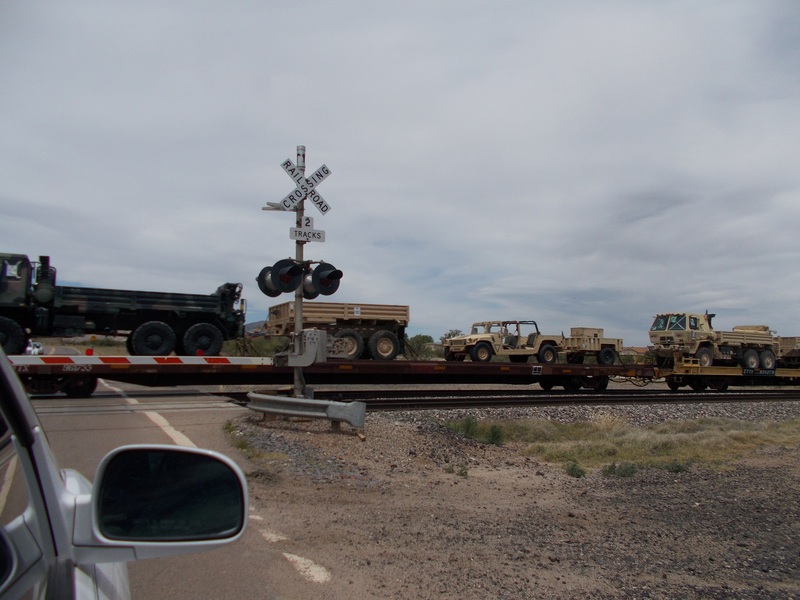 Yesterday we saw this train going west through the town of Dragoon Mountains, AZ. I took a few pictures but there was at least every train car full on the whole train. Every car was filled to capacity and it was very long, we sat at least 1/2 hour . 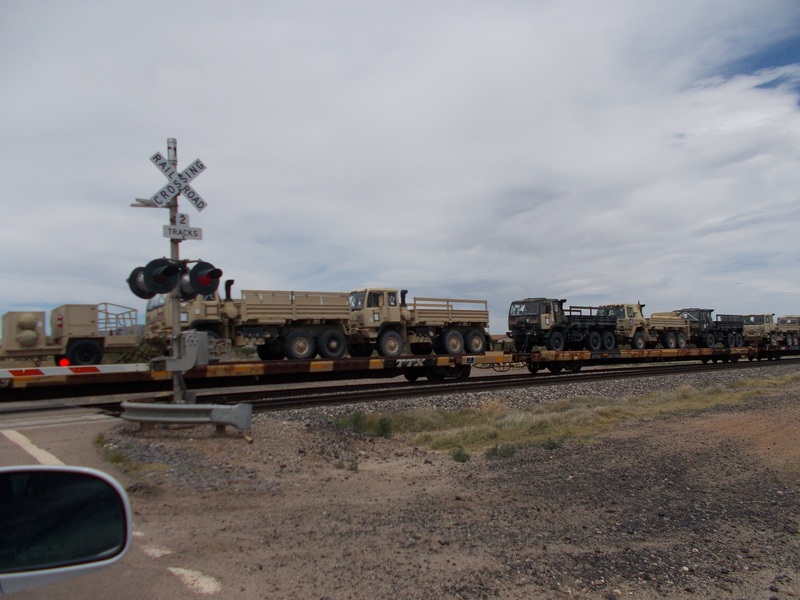 I have never seen that big of a train with all the military equipment on the cars. Looks like war is in the air. Would love to get ahold of one of those cargo trucks with a trailer, nice piece of machinery.. 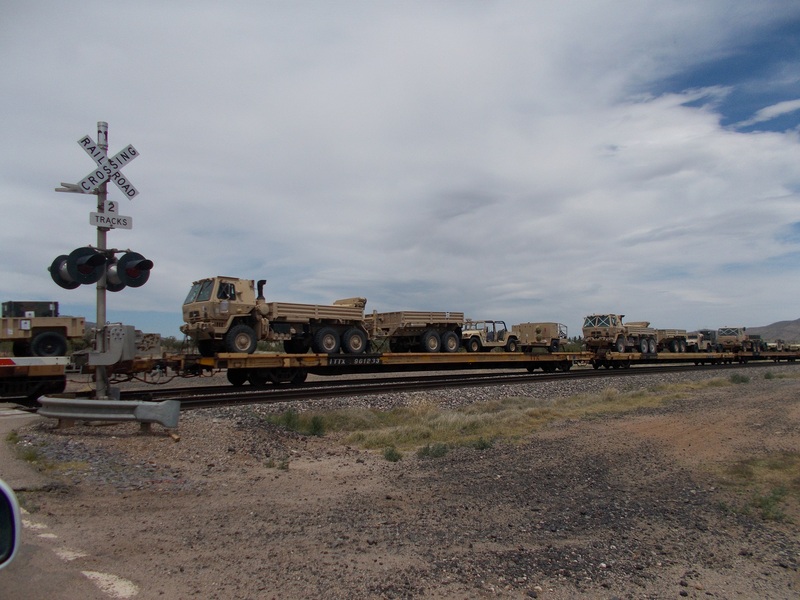 The one thing missing from the many sightings of military equipment on the move are the real fighting vehicles. Where are the tanks, the APC’s, the artillery, the actual combat vehicles? There are two APC’s in the top picture but they look like recovery vehicles such as mechanics would drive. 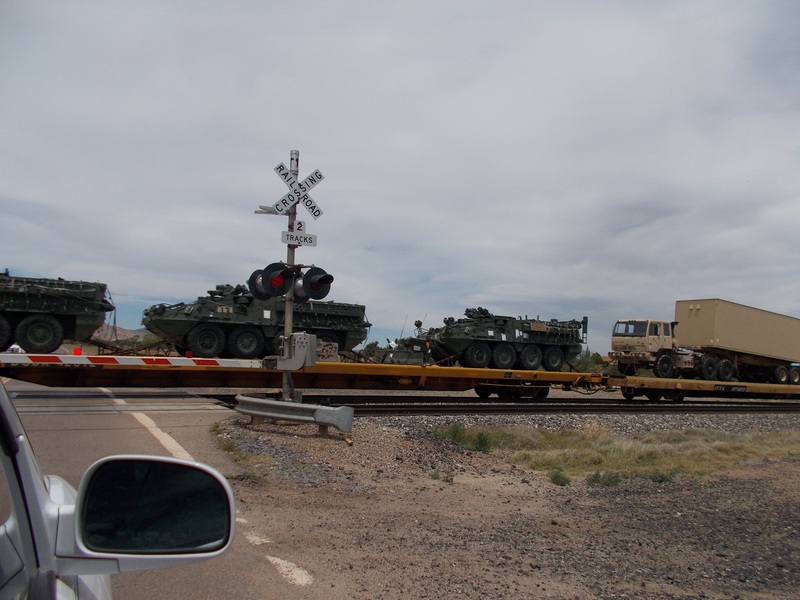 Hey guys I didn’t see this train but a neighbor sent me the pics. He is a retired Trucker. The machinery is headed out of this area but something big is going on here. The private land owners are trying to be driven out of here by the Arizona Department of Water Resources and the gmo farmer and a few organic small growers in Sunsites. They have grouped together and drew of a petition to stop all new well drilling permits. That means also permits to deepen existing wells should they go dry. I am told that a huge amount of gold has been taken out of the Dragoon Mountains (Cochise Stronghold) and that it has been sent to Portal and shipped out of the country. I don’t think much of this has to do with the water but to drive out the home owners so that the large landowners (Free Mason’s) can get the gold and have their way without a fuss from the people. Without water their would be no people here. I would hope someone could do some investigation here on this gold thief as it belongs to the people in AZ. A man that goes by the name of “Randy Redhawk” heads up as a self appointed spokes person for the community of Pearce. He has a website last I looked. He is not an Indian and no one knows his real name but lives up in the Stronghold in a five sided house (pentagram) with a tiled Phoenix Bird in the center under a skylight. No this is real I saw it with my own eyes and the Good Lord Jesus as my witness. I questioned his involvement in the water situation as he gets his water from the mountain springs. So what is his connection with the water? No it’s not the water but the gold.